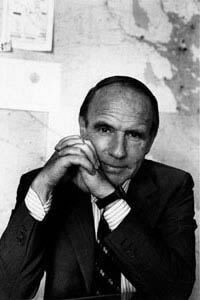 Prince Sadruddin Aga Khan, KBE, KCSS (Urdu: صدرالّدين آغا خان‎, Ṣadr ad-Dīn Āghā Khān, 17 January 1933 – 12 May 2003) was an Iranian prince and diplomat. He was the son of Aga Khan III. Khan was known as the 4th United Nations High Commissioner for Refugees from 1966 to 1977. He helped shift the focus beyond Europe and prepared it for fix and aide hard refugee issues. He was a strong supporter that the United Nations should work alone. Khan died of cancer on 12 May 2003 in Boston, Massachusetts at the age of 70. ↑ Secrétariat de Son Altesse l'Aga Khan, Aiglemont (14 May 2003). "Prince Sadruddin Aga Khan's Funeral Ceremonies in Geneva". Press release. http://www.amaana.org/agakhan/sadruddin3.htm. Retrieved 13 October 2010. This page was last changed on 20 August 2018, at 09:12.